ST. GEORGE — You don’t have to live in Hollywood to succeed in the film industry, something Santa Clara resident Lyman Dayton has proven many times. And now this renowned filmmaker is giving local hopefuls an opportunity to not only learn the ins and outs of how to succeed in the film industry but also a chance to appear in a real-life television series. Dayton has 17 films to his credit – dating from 1970s-era hits like his award-winning adaptation of “Where the Red Fern Grows” to 2016’s Southern Utah-made film “Drop Off” – and beginning in February, Dayton’s film production company, Doty/Dayton Productions, will present a special acting workshop for Southern Utah actors and would-be actors. This isn’t just any workshop. Participants will not only receive specialized training from film industry professionals, but they will also be guaranteed spots as either extras or bit players in “Seven Together,” a television series Doty/Dayton is currently developing. Workshop participants will also have the opportunity to audition for lead roles in the show, contingent upon the series being picked up by a television network. Specific dates and locations for the workshop will be announced once all participation slots are filled. 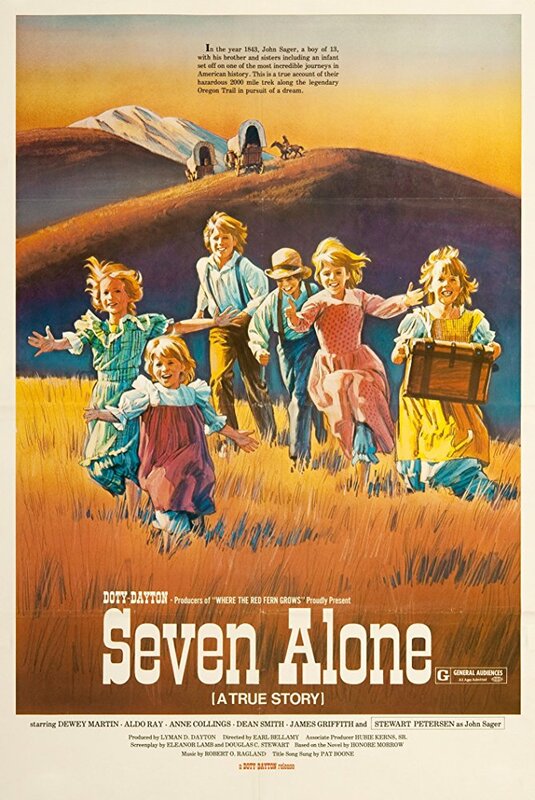 One of Dayton’s early hits as a filmmaker was the 1974 feature “Seven Alone,” which tells the true story of seven orphaned children forced to complete a treacherous trek from Missouri to Oregon on their own after their parents die on the trail. A standout hit for Dayton, who produced the film, “Seven Alone” grossed about $18 million at the box office. Doty/Dayton Productions is currently developing a television series based on the story, which is planned to bear the title “Seven Together” and will be pitched to various television networks. The upcoming workshop being hosted by Doty/Dayton will serve multiple purposes, one of which is to scout talent for the TV show from among workshop participants. Actors will be needed for various child and adult roles in “Seven Together,” and Dayton and his associates will have a sharp eye out for untapped talent as the six-week workshop progresses. When casting past films that featured children, Dayton said he didn’t want “Hollywood kids” to fill the roles but rather wanted to find raw, natural talent in first-time actors and help them learn to be themselves on camera. He plans to use that same approach in finding the stars of “Seven Together” and in structuring the upcoming workshop. The acting workshop will take place over a six-week period. A schedule will be developed and Southern Utah locations chosen for the workshop based on the needs, schedules and locations of the participants once all of the slots have been filled. The cost for the workshop is $300 per participant, and it is open to both adults and children. The workshop will feature two primary components: actor training for film and education regarding the practical aspects and realities of navigating the film industry as an actor. Dayton will provide actor training from a director’s point of view, helping participants learn natural techniques for being in front of the camera. Dayton’s longtime associate Shelley Monson, who has worked with him on film projects for more than 25 years, will provide instruction regarding the footwork needed and the realities involved in making it as an actor in the film business. She will instruct participants in matters ranging from putting together an acting resume to successfully participating in production interviews and working with an agent. Workshop participants will have the opportunity to meet with real talent agents and make the kinds of key connections that can help them find success as actors. “We may not guarantee they will get an agent, but we can put them in touch with an agent,” Dayton said. To sign up for the workshop or for more information, contact Lyman Dayton at 435-705-6450.